Cross Country weather showed up for the second week in a row at Fernhill Park in Portland, Oregon. Last week a downpour muddied the course during the Concordia Puma XC meet and this week it was the PDXC final race of the series. Middle schools and youth clubs came out for some great competition. All in preparation for the Oregon State Middle School Championships to be held at the same course next week and the USATF Junior Olympics with some shooting for Nationals coming up in Reno, Nevada. It started with a mile for 3rd-4th graders, a 2000 meter course for the 5th-6th grade runners and a 3000 for the 7th-8th graders with races run for both boys and girls. For a first year series it was well attended and a success. Organizer Mike Bergmann recaps the series and then his son Peter Bergmann walks over and gives a play by play of the 7th-8th grade boys race which he had just won. Above is Jackson Frank 3rd place, Truman Rae 1st, and Daniel Thompson 2nd. All three are tough competitors and really great kids. 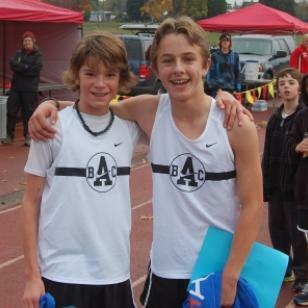 They've consistently finished in the top over the last year and you can watch for them to do well at Junior Olympics. I didn't recognize Daniel right off and he thankfully reminded of his success at CYO last track season. This is Eli....the question I forgot to ask him was what kind of vegetables his mom was feeding him to get that stache going so good. Word is that his teammates call him Sudan. You can ask him why. 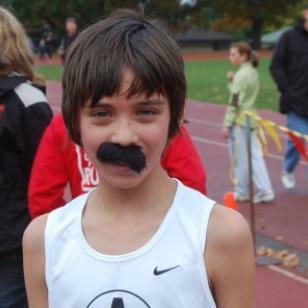 Nice race Eli-Sudan-Mustache Man. Kyle Thompson L. finished 2nd behind Peter Bergmann R.